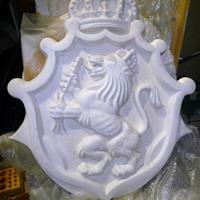 Large plaster medallion for the Stroh Brewing Company. Relief depicts a lion wearing a crwon standing on his hind legs. He holds objects in his front paws. Surrounding the lion is a scroll-like frame with a crown at the top.